Here is a recent job completed by caricature artist Zalo. Please make it a caricature of the photos not a portrait. The plan is to make it fun! The women in the photo likes to bowl, plays volleyball and softball. The man in the photo likes to trap shoot and works in the oil fields. They are both from western Kansas, USA and love watching Kansas Jayhawk college basketball. 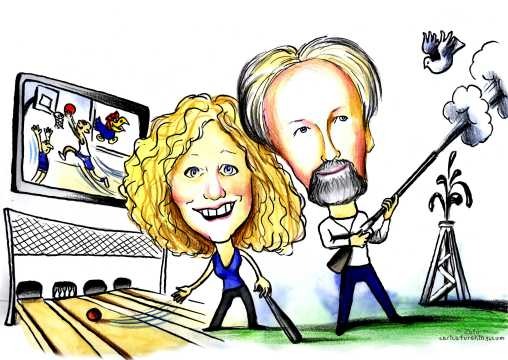 The caricature is a gift for their 30th Wedding Anniversary.